What Can You Do to Stay Enrolled in the PSLF Program? 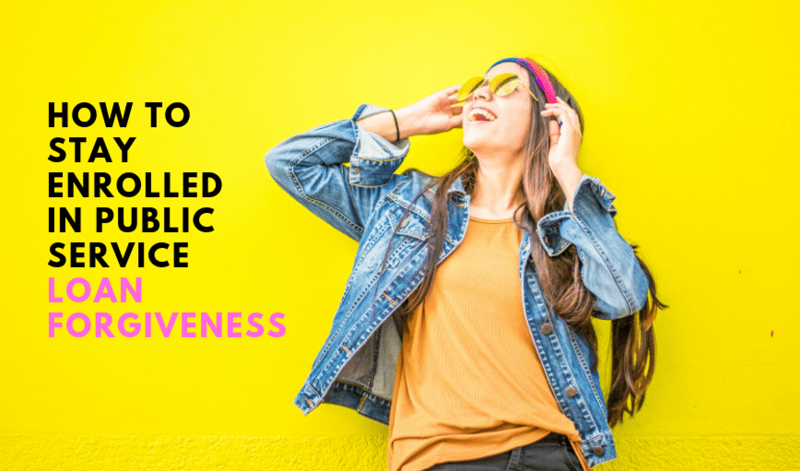 Last month’s blog discussed why many people are unable to receive loan forgiveness through the Department of Education’s Public Service Loan Forgiveness program (PSLF). The Department of Education allows some federal student loan borrowers working at certain public service jobs to receive tax-free loan forgiveness. However, the PSLF program has numerous requirements. You should ensure that you stay qualified if you are enrolled in this program. Please note that information in this blog post is subject to change, and that any recommendations in this post are not to be construed as legal advice. You will need to make 120 timely payments to qualify for PSLF forgiveness. Your student loan servicer offers an automatic payment option. By enrolling in this option, your bank account will be automatically debited each month to pay down your balance. If you’re financially organized and aware of the timing of these withdrawals, this step could help you avoid late payments. You cannot receive PSLF forgiveness unless you are enrolled in one of the four income-driven plans (IDR plans) offered by the Department of Education. These programs require you to recertify your income each year. Your student loan servicer should send you a notice that the recertification deadline is approaching. The warning may arrive by email several months before the deadline. Once it is time to recertify, you will need to submit your most recent tax return or some other form of income documentation. It is also possible to recertify without income. We have written blogs that can help walk you through this process. You will be kicked out of your current IDR plan if you forget to recertify, which could delay your ability to make qualifying payments towards PSLF forgiveness. Only certain borrowers can qualify for the PSLF program. If you’re one of them, it’s because you are working at a “qualifying” public service job. We encourage you to read a blog we published on what counts as qualifying employment. You should submit the Employment Certification Form (ECF form) when you start a qualifying public service job or when you switch to another employer who qualifies under the program. Submit the form to your student loan servicer each year. If you are enrolled in PSLF, then MyFedLoan is your servicer. MyFedLoan, which is owned by the Pennsylvania Higher Education Assistance Agency, operates the PSLF program for the Department of Education. Make sure the ECF form does not contain any errors, such as the wrong Employment Identification Number (EIN) or incorrect start date. Be sure to keep hard and digital copies of the forms that you send MyFedLoan. Include the date that it was sent and any correspondence they send back. Assume that your loan servicer is going to make mistakes. There are numerous reports of loan servicers losing PSLF paperwork. Keep digital and hard copies of any paperwork that you send to MyFedLoan or the Department Education. You should also keep records of any correspondence, such as when you received letters or made phone calls. Should the worst happen, you can dispute a PSLF denial with your servicer by using this evidence. The Sader Law Firm provides regular updates for student loan borrowers who are struggling with repayment. Continue to follow our blog as we post future updates on topics that can help you tackle your student loans and other debts. Follow us on Facebook to receive regular updates.